A Construct-Based Approach (CBA) to school counseling is an innovative methodology for addressing students’ learning and developmental needs through delivery of a comprehensive PreK-12 school counseling program. A CBA is informed by what research has determined to be relevant constructs and effective practices that are strongly related to students’ academic achievement and well-being. 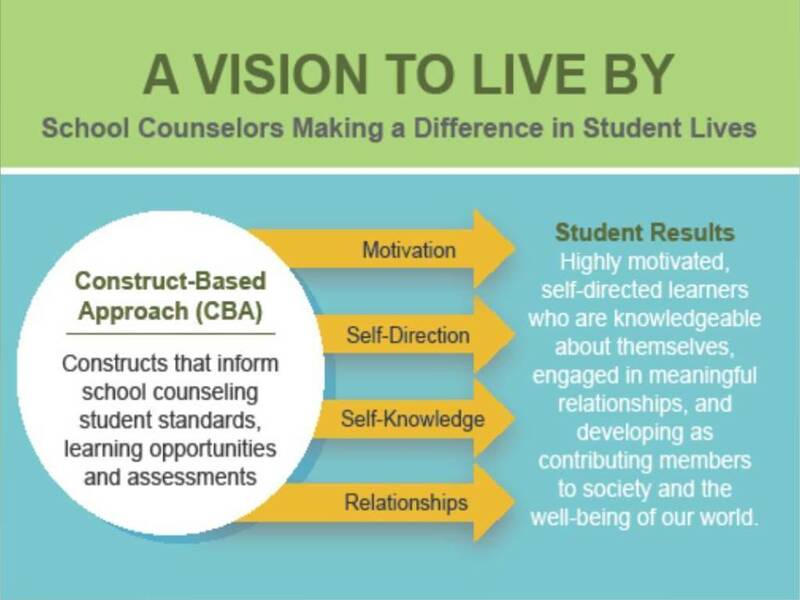 The CBA is inspired by a vision of excellence in which school counselors make a profound difference in student lives and learning. The CBA is a systematic approach supported by research that addresses student needs through school counseling programs. It consists of structured processes, clearly-defined protocols and easy-to-use tools. The Website is designed to help you develop, deliver and evaluate a CBA in your school and district. The CBA is not intended to replace your school counseling program. Rather, it is intended to help you enhance your current program by clearly defining standards for student excellence, developing and delivering meaningful learning opportunities to help students achieve the standards, and evaluating the impact of a CBA school counseling program on student learning and lives. The CBA is articulated in three formats which collectively will help you understand the essential nature and functionality of a CBA and how to develop and integrate it into your current school counseling program. Ordering information for the Book and Toolkit can be accessed via the link in the Sidebar to your left. Achieving Excellence in School Counseling through Motivation, Self-Direction, Self-Knowledge and Relationships (Corwin, 2014). Our book provides the research-base and conceptual foundation for a CBA. Construct-Based Approach (CBA) on a Flash Drive (Corwin, 2015). A collection of 61 tools on a flash drive to help you develop, deliver and evaluate a CBA in your school and district. A one-page (front and back) color summary entitled “CBA Toolkit in a Nutshell” is provided. The Nutshell displays the names of all 61 tools and how they are organized, along with the results you can expect to achieve by using them. It is recommended that when you print a copy of the Nutshell that you print it in color on the front and back of a single piece of glossy paper. Page aesthetic is important when trying to promote a CBA to your colleagues and members of the school community. 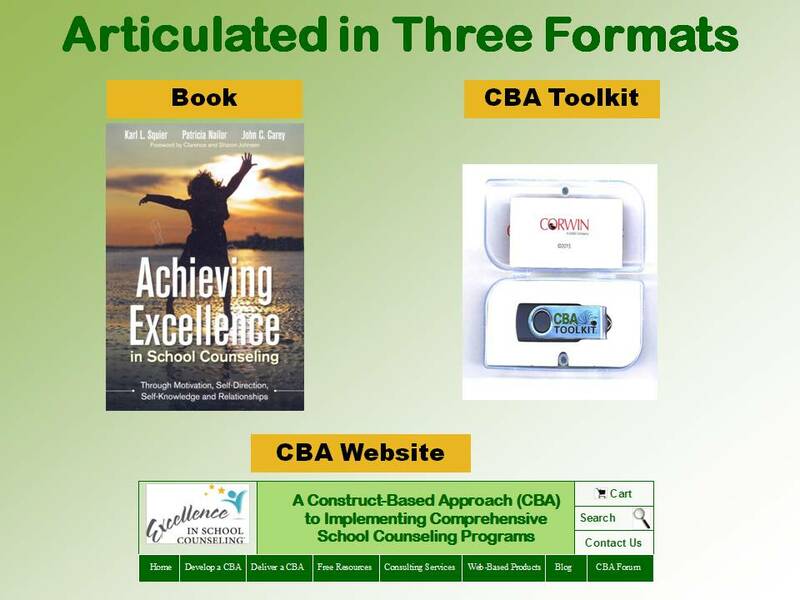 The CBA Website is not intended to replace the Book and Toolkit, but to provide additional and more in-depth information for getting started, designing, delivering and sustaining a CBA as an integral component of your school counseling program. Updates to the Website will be made on a monthly-basis. Successful CBA school counseling programs are developed, delivered and evaluated in a community of dialog, reflection and collaboration. Establishing such a community enables everyone involved in the school counseling program to identify and commit to common goals that can be achieved through shared experience. Successfully developing, delivering and evaluating a CBA require individual initiative and collective action. Both should be evident in your efforts to integrate a CBA into your school counseling program. The Website includes a CBA Blog that discusses important issues related to a CBA and the school counseling profession. The Website also provides an opportunity to engage in dialog about a CBA through a CBA Forum. 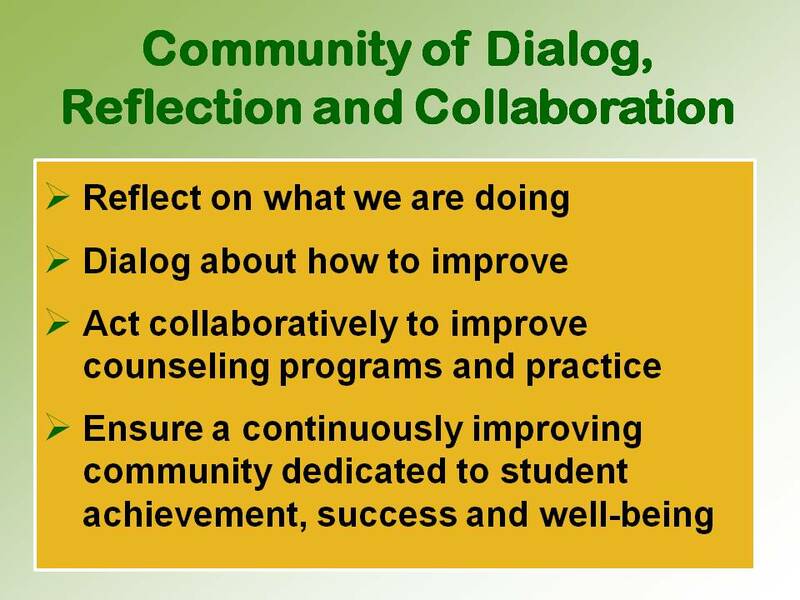 We encourage you to explore the CBA Website and invite you to dialog with us about how a CBA can be used to improve school counseling programs. By establishing common goals that are achieved through shared experience, our dialog can be transformed into effective practice. The Navigation Pane is located at the top of every webpage in the CBA Website. It contains the Website logo and title of the Website. In addition, it provides single-click access to the “Shopping Cart,” “Search,” and “Contact Us” functions. Cart. This allows you to purchase consulting services and web-based products using PayPal. PayPal is also set up to receive major credit cards. Consulting service and web-based products can also be obtained via purchase orders sent electronically via the “Contact Us” function on our Website or by snail-mail to Dr. Karl Squier, 143 Front Street, Suite 9, Lincoln, RI 02865. Search. This allows you to search the CBA Website. Contact Us. This link can be used to contact us. Each module contains multiple webpages. Each webpage is divided into two columns: “Sidebar” (left column) and “Webpage Content” (right column). The “Sidebar” column contains a list of all webpage titles in the selected module. For example, when you click on “Home” in the dark green shaded row in the Navigation Pane, titles of the major subordinate webpages will appear in the Sidebar. Lower level subordinate pages are indented. The “Webpage Content” column contains information related to the topic specified in the webpage title. This column may also contain images, links to other webpages in the Website, “pdf” and “docx” files related to the topic, and/or websites external to the CBA Website. At the top of the right column on most webpages is a menu of topics discussed in that column. You can go directly to any of the topics by clicking on the desired topic name. Also at the top of the right column just under the menu items is an opportunity to click on a link to access a “pdf” version of the webpage. Clicking on the link will open the “pdf” file in a new tab. From there you can choose to print or download the file. Closing the tab will return you to the webpage. Links to these files are also available in the “Free Resources” module. This module contains general information about the Website, how the Website is organized, and steps to take to get started. Define Student Excellence. This section discusses the research-base for a CBA and why the constructs and associated sub-constructs are fundamental to a school counselors helping students develop and learn. It also discusses how a CBA defines student results (standards and competencies) that articulate what students are expected to know and demonstrate as a result of participating in the CBA school counseling program. Develop Learning Opportunities. Discusses how to develop and document meaningful learning opportunities that help students achieve the standards and competencies. Learning opportunities are delivered primarily through delivery of a CBA school counseling curriculum. Develop Student Assessments. Discusses how student progress, proficiency and achievement are assessed and reported. This section also discusses how a Protective Factors Index (PFI) can be used to gather data on students’ social-emotional development, and how the results can be reported on student report cards. Plan for a CBA. Discusses a complete four-phase planning cycle for school counseling programs and four types of plans to be developed. Implement a CBA. Discusses delivery of a CBA school counseling curriculum and how to establish a reliable school counseling support infrastructure (e.g., roles and accountabilities, policies and protocols, fluid communication network, professional development program). Evaluate a CBA. Discusses three types of evaluations used in a CBA: a) intervention evaluation that examines various components of a CBA program, b) whole program evaluation that examines the entire program every five to seven years, and c) school counselor performance evaluation that helps determine highly-qualified professional school counselors. We offer both online and onsite consulting services. This module provides a description of the services we offer. An online course on the CBA is also offered by the University of Massachusetts, Amherst’s Continuing Education Department. A course syllabus is provided in this module. These are products, primarily packaged curriculum, which we offer for purchase. There are many individual CBA curriculum activities that are offered for free in the “Free Resources” module. Products for purchase contain integrated sets of activities and are much more comprehensive in nature. A Blog will be posted at least once a month to discuss our thoughts on the CBA and other critical issues related to the school counseling profession. A community of dialog, reflection and collaboration is critical to the success of a CBA. The CBA Forum is included on our Website to encourage dialog among school counselor practitioners, counselor educators and the authors of the CBA. Please join us in dialog by posting your ideas and experiences ion the Forum. The CBA Website can be accessed from any computing device with access to the Internet. A printer will be needed if you decide to print files contained on the Website. Webpages are written in HTML. The Website also contains two types of files that can be printed and/or downloaded: a) Adode “pdf” files and b) MS Word “docx” files. In order to print and/or download the “pdf” files you will need to have Adobe Reader installed on your computing device. A link for downloading the reader for free is provided in the Sidebar in the Home module. You will need to have MS Word (2007 or later) installed on your computer to use the Word templates. It is assumed that users of the Website have a working knowledge of these software products. The CBA Website is a journey of exploration, discovery and action. Please bring your critical thinking, self-reflective and collaborative skills with you when exploring the Website. The templates contained on the Website represent our best thinking to date. They are not carved in stone. We hope you will use them as models for developing your own data gathering instruments. We encourage you to reflect on what you would like the templates to do for you, and modify them to meet the needs of your students and counseling program. Because sophisticated tools for number crunching, data analysis and reporting are already available, some of them free, the CBA templates are intended primarily as examples of how data can be gathered, organized and reported. They work fine as paper-based instruments for gathering data. They can also be used as electronic tools for recording data results in a Word file. We recommend that these templates be used to get started, but optimally you may wish to take the data from the templates and plug them into more sophisticated software. CBA templates do not contain tallying functions, except for the ability to add columns of numbers in a Word table. Start by reviewing the “CBA Overview” which you can access via the hyperlink in the Sidebar to your left. This will help you gain a deeper understanding of the purpose and functionality of a CBA. As a way of acclimating yourself to the layout of the website and how to navigate it, we recommend that you click on each module title in the dark green row in the Navigation Pane at the top of each Webpage. From there, familiarize yourself with the various section listed in the Sidebar. All webpages associated with a specific module are listed in the Sidebar as long as you remain in that module. That’s about it by way of introduction. Thank you for visiting the CBA Website. tools to help you improve your school counseling program, counselor practice and learner outcomes. Add our Website to your Favorites. Come back often. We encourage you to participate in our CBA Forum. Watch for us on Facebook and Twitter. will be published and new information and tools added to the Website on a monthly basis.